"A teacher was gunned down along with his two children at a Jewish school in southern France Monday, while the director of the school saw his daughter shot and killed in front of him, French President Nicolas Sarkozy said in a somber appearance at the school. It is the third time in the past 10 days that a gunman on a motorcycle has fired on minorities in the southwest of France. French soldiers of north African origin were shot and killed on March 11 and March 15." The Great Mother of us all weeps. "It is my hope that through telling stories like Michael’s, we are reminded of how easily society can change in the face of evil– how even today, large scale human tragedies are happening around the world. We must never forget our past, in order to ensure that a catastrophe of this magnitude never happens again." ~ May there be no more crusading burning times for any of us. Alot of interesting synchronicites converge on this day. FIRST, I dreamt last night (well, actually this morning) of the sea rising up on the coast where, in the dream, I was. The sea rose up as a mighty tidal wave roaring toward the land, wiping out everything in its path. Well, not everything exactly. I was in a big building on the shore by the sea with a small group of people. To avoid the destruction of the building and to prevent floodwaters from entering the building and drowning all of us, I and another person, held a large sheet of white material across the open doorway (which had no door). 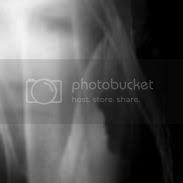 We two held the white material across the doorway at very specific places which we intuited to be the only places where holding the sheet across the doorway could protect us. It didn't matter that the sheet flapped open in the air every other place where the sheet was not being held by us. Holding it as we did, where we did, kept the building standing intact and unbreached by the floodwaters of the tidal wave as it rolled in across the land and submerged the building under the sea. The tidal wave came over the land, submerging in the sea water my group's building and everything outside it. The wave rolled past and the sea retreated, but we knew another tidal wave was coming. This time, we knew that covering the door was not the needed action to protect us. This time, I and the other person from the group stood at the glass window which faced the sea as we looked out of it. We turned our backs against the window, looking into the room of the building. We just knew the action to do to protect us from being drowned by the sea wave and to keep the building standing against the might of the wave rolling in. My child ran up to us as we stood with our backs against the window, waiting for the rising sea and its tidal wave to reach the land. I grabbed my child up in my arms and set the child down in front of me, turning also the child's back to the window in alignment with ours as we stood strong against the onslaught of the sea. Now there were at least 3 of us standing guard in opposition to the massive sea wave - myself, a man and a child. The wave came, covered over the building, and moved on as the sea again retreated from the land. We went outside the building and saw all of the destruction, but our building still stood despite being being struck twice by tidal waves which had deeply covered and swept over it. We knew another wave was going to come, we worried another strike by the tidal wave might be more than the building could withstand despite our protective actions, and we wondered if we should try to run to the highlands to escape it or stay put in our building - we didn't know if we had time to make it to higher ground before the next tidal wave struck. I am quickly losing memory of this part of the dream, but there was a building structure near me outside which I specifically observed and took note of in my line of sight, and I also remember that the prophet had said something once to me about two days (not directly about the building or the tidal wave, but in riddles), and while I can't remember the exact words, the prophet had spoken of these days in such way that I knew that the building would still be standing for at least two more days from that day (in the dream), as the prophet had spoken of the building's presence (in the prophecy) on a day two days into the future (and a day without tidal waves) from the day (in the dream). I knew that no matter how many waves hit our building, the building would withstand it, as it had at least two more days left of Presence in the world - the prophet had seen and spoken in note of our building when speaking of a day two days into the future. The waves would not last for two days into the future (I just knew this as a matter of fact), so we decided to stay in the building to ride out the rest of the waves until they subsided. I woke up. THIRD, after watching the movie, I came back to my computer to write of these two synchronicities, but decided to check out the posts on some of the blogs I haunt before beginning with the task of writing my own blog post. Interestingly, one of them has written today, "the WAVES are great" in Australia down under. My universe is today talking all about great waves. And one thing the universe is telling me is to not worry about any of the waves which may come, because I will still be standing after the waves are all long gone. This list shows the top 16 best mtDNA genetic matches for me in the world. These top matrilineal ancestral root matches cover a period time from within the last 300-400 generations since the last Ice Age to the present. In other words, in all the world, tracing the data from the last Ice Age to the present, the information shows (quoting from the results) "where in the world (I) have matches to (my) mtDNA. These matches indicate (my) maternal geographic ancestral roots." 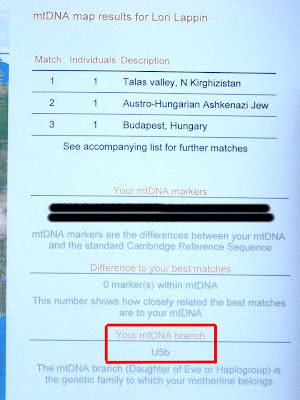 As indicated in the previous post, where it says that I have "0" "difference to (my) best matches", it means that all of my matrilineal genetic matches are EXACT matches to my own defining motherline genetic markers. Quoting, "a difference of "0" indicates that we have exact matches for your samples." So, the matches in this list are all exact matrilineal genetic matches to me (as far as matrilineal motherline defining genetic markers are concerned). The people on this list are my matrilineal genetic twins, so to speak. Hey, hey, happy day! I received the final hardcopy report and final results of my mtDNA ancestral motherline genetic analysis today! Here is a redacted photo of the hardcopy result showing confirmation that my motherline genetic haplogroup is U5b (Clan Ursula - the most ancient motherline in all Europe). In all the world, tracing the data from the last Ice Age to the present, the information shows (quoting from the results) "where in the world (I) have matches to (my) mtDNA. These matches indicate (my) maternal geographic ancestral roots." When it says that I have "0" "difference to (my) best matches", it means that all of my genetic matches are EXACT matches to my defining genetic markers. Quoting, "a difference of "0" indicates that we have exact matches for your samples." How cool is that! This is consistent with the results of my autosomal STR Middle Eastern Panel, which indicate that my ancestors spent a long time in the Middle East (as well as in Northwestern Europe per my European Panel). 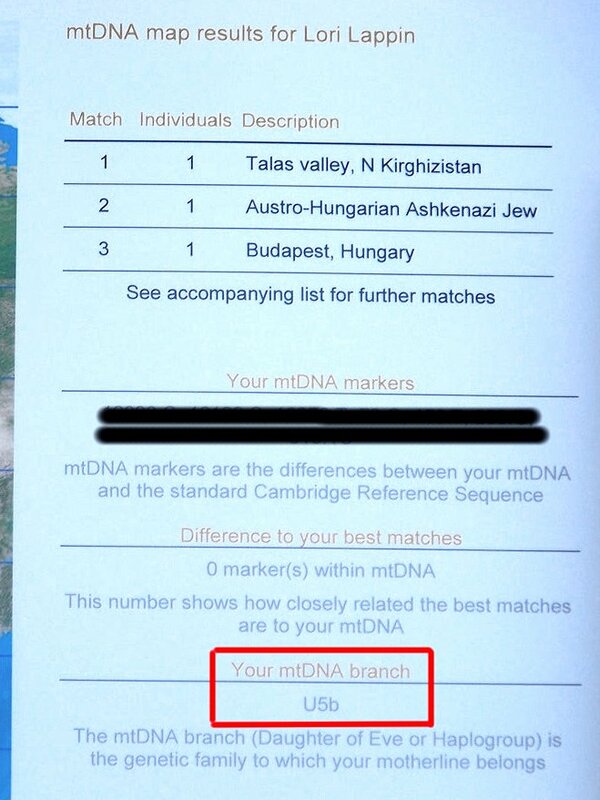 My own mtDNA results, coupled with my STR regional panels, strongly suggest that I am an Ashkenazi Jew (given my closest genetic matches from my mtDNA results) originally from the Middle East whose ancestors have also spent significant time in Northwestern Europe and Scandinavia, acquiring an admixture of genes there as well. You know, I think that once a person begins to explore his or her own roots for real, digging deep into the evolutionary path of the human species, a transformation of emotion can easily occur as s/he begins to emotionally assimilate the beautiful truth that we are all indeed really one big interconnected family of creatures walking upon and sharing this lovely planet together. In follow-up to my earlier post on the Middle (Near) Eastern origin of Haplogroup U (Clan Ursula), this Hg's persistent continued historical presence in the Middle East (even following a large settlement of Clan Ursula in Scandinavia) is further evidenced by the presence of a remarkable amount of Middle Eastern matches in my autosomal STR Middle Eastern Panel results. I have both Jewish and Arabic matches in varying amounts according to location and subpopulations within those locations. Given the fact that I've had American Ancestors in this country from before it was even the United States of America, and that some of my American ancestors fought in the American Revolution (and one ancestor even signed the Declaration of Independence), means that my American ancestors have been in this country for hundreds of years. One ancestral clan from Wales has been here since the mid-1600's. Yet, despite that, my Native American Panel came back with no genetic matches at all - all zeros. 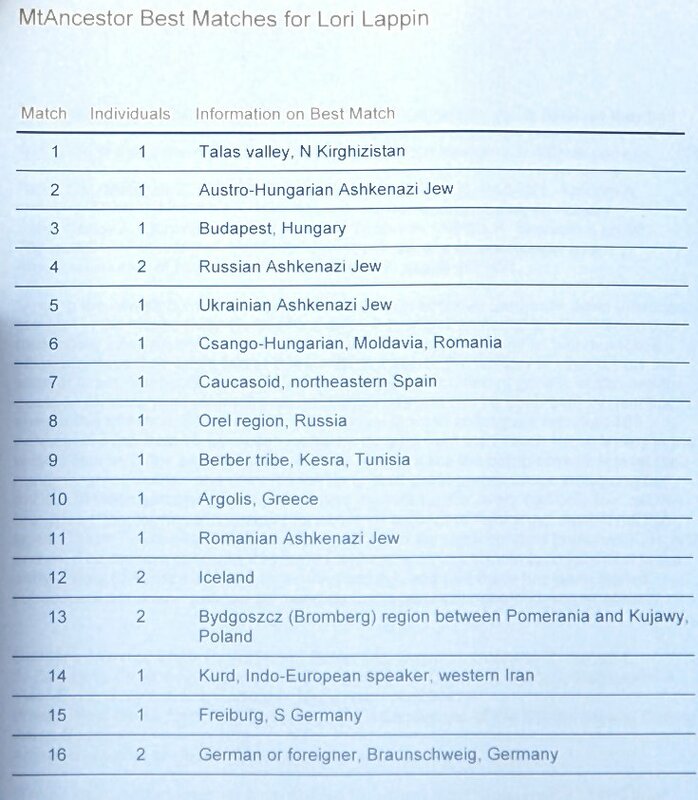 This lends support to the idea that Hg U must have had a long presence in the Middle East for me - someone of Clan Ursula - to have picked up such a large and diverse amount of both Middle Eastern Jewish and Arabic genetic matches, even though some of them have a low Tribe Score. It is debated among the scientific genetic community as to whether Clan Katrine (Hg K) originated in Europe or the Middle East, and the longstanding presence of Clan Ursula (from whom Clan Katrine descended) in both Europe and the Middle East makes the question even more debatable. From these maps (source - Roots for Real), we can see that the simple thinking that Clan Ursula is simply European is simply erroneous. 1 To qualify as a founding Clan Mother, the woman must have had at least two surviving daughters through whom to pass on her mitochondrial DNA. The mathematical reasoning behind this requirement is explained in detail in Bryan Sykes' book, The Seven Daughters of Eve. Research released in 2006 by Doron Behar shows that 40% of Ashkenazic Jews descend in direct maternal line from one of four women. There remains debate and disagreement within the scientific genetic community as to whether or not the mtDNA haplogroups (Hgs) of these four women are of Middle Eastern or European origin. The original Behar research paper concludes that the mtDNA Hgs associated with these four founding women to be: K1a1b1a, K1a9, K2a2a and N1b. Of course, these four founding maternal Hgs don't include 60% of Ashkenazic Jews or any non-Ashkenazic Jews. The Behar paper defines "Ashkenazi" as referring "to Jews of mainly central and eastern European ancestry, in contrast to those of Iberian (Sephardic), Near Eastern, or North African origin." I'm not sure how Jews of additional Northwestern European heritage fit into this definition. Although I carry at least one of the defining genetic markers of the K2 Hg subclade, I'm not sure how any of these research findings are directly relevant to me except to show that I'm likely not from that 40% of Ashkenazic Jewry covered by Behar's study. On top of my mtDNA motherline preliminary results and autosomal STR results (each result from a separate independent lab from different countries) both showing top matches to Hungarian Ashkenazic Jewry, my autosomal STR genetic analysis results also showed a top match (#2) in my High Resolution Global Population scores to the Azores (specifically, Azores Archipelago) with a high Tribe Score of 0.97. To improve the genetic characterization of the Azorean population, and to clarify some aspects related to the history of settlement, a study of mtDNA was conducted in the population of the archipelago. The archipelago is formed by nine islands of volcanic origin that define three geographical groups: Eastern (S. Miguel and Sta. Maria), Central (Terceira, Faial, Pico, Graciosa and S. Jorge) and Western (Flores and Corvo). All the analyses performed support the idea that, in the whole group of islands, the majority of mtDNA lineages originated from the Iberian Peninsula, mainly from Portugal (mainland). However contributions from other European populations, especially from Northern Europe, cannot be disregarded. The values obtained for the various diversity parameters in the Azores archipelago indicate that the Azorean population, as a whole, does not exhibit the typical characteristics of an isolated population. African haplogroups were found in all the groups of islands. Therefore the presence of Moorish and African slaves on the islands, as reported in historical sources, is supported by the mtDNA genetic data, especially in the Eastern group. The presence of Jews in the Central group is also supported by the mtDNA data. So, my Northern Europe and Semitic Jewish genetic links are both represented together here in the Azores as well as in Europe. Another interesting piece of data to come out of this for me relates to the genetic evidence for an admixture of both Northern European and Jewish genetic material with Black African genetic material. This is interesting to me because, in my STR results (comprehensively analyzing genetic markers inherited by me through both parents), though not high enough to rank among the top five, in my High Resolution World Match Regions, my scores for both North Africa and the Horn of Africa were not zero either. My highest world region Tribe Score (Northwestern Europe) at 0.94 compares to North Africa with a Tribe Score of 0.61, and to the Horn of Africa with a Tribe Score of 0.04. So, while the genetic contribution of the African regions are not relatively high for me overall, there is significance evidence of African ancestry for me subsequent to the initial migration of my ancestors out of Africa. While this does not prove that my ancestors were slave-owners or slave-traders, it does further highlight the diverse admixture of DNA from Northwestern European Caucasian, Semitic Jewish and Black African ethnicities in my own ancestry. It also looks to me that the Northern European, Semitic Jewish, and African haplotypes (all three also belonging to me) found in the Azores are secondary contributions to the "Iberian majority of haplotypes which originated on the islands." Another point of note, the Azores score high on my comprehensive STR results which analyze the genetic markers I inherited from both parents. Although I have yet to receive the final result of my motherline mtDNA analysis, the preliminary results don't mention the Azores at all, and the islands aren't marked as one of my top 16 matches on my mtDNA map. So, it looks to me that, while the islands score significantly in my comprehensive STR genetic analyses, they don't seem to significantly impact the genetic history of my motherline. So, taking all the Azorian data together suggest that I may also have Jewish contributions (as I clearly do with Northwestern European) to my genetic profile through many ancestors distinct from those comprising my motherline. The oldest mtDNA in Europe which is human (i.e. Homo Sapiens and not Neanderthal or other archaic individual) is U5 and U8a. The age of U5 is estimated at 50,000 but could be as old as 60,500 years. The presence of haplogroup U5 in Europe pre-dates the expansion of agriculture in Europe. Bryan Sykes' popular book The Seven Daughters of Eve says it shows up 45,000-50,000 years ago in Delphi, Greece and named the originator of haplogroup U5 Ursula. It shows that U5 is the first out of Africa into Europe, and that it shows up as the first Europeans in two places, Delphi and Spain around 50,000 years ago. By another source haplogroup U5, age is estimated at about 52,000 kya, being the oldest subclade of haplogroup U.
Haplogroup U5 and its subclades U5a and U5b form the highest population concentrations in the far north, in Sami, Finns, and Estonians, but it is spread widely at lower levels throughout Europe. This distribution, and the age of the haplogroup, indicate individuals from this haplogroup were part the initial expansion tracking the retreat of ice sheets from Europe ~10kya. Here is a list of mtDNA haplogroup defining mutations - the mtDNA markers I have been given thus far place me into the U5b haplogroup according to this list as well, although I do have an "extra" mutation (16093) among my relevant mtDNA markers that is often associated with the K2 subclade of mtDNA haplogroup K, though I don't have any of the defining mutations for that haplogroup overall. Perhaps this is one reason the researchers at the lab are checking my results by hand - to make sure that I don't also have one of the overall defining mutations (146*, 1811, 3480, 9055, 9698, 10550, 11299, 14167*, 14798, 16224, 16311) of haplogroup K, which might blur where I fit in - with U5b or K2. From this newer chart (below) showing the relationships between the haplogroups, we can see that both U5 (my assigned primary haplogroup, with U5b being my subclade within U5) and K descended from U (often called UK in the literature, a superhaplogroup known also by the clan mother name Ursula). If I actually have a defining marker from both U5 and K, I could go into either U5b or K2. I wonder how they decide into which group to put you in that case? At any rate, right now, no defining marker for K overall is being reported to me, but all of my results aren't in yet and they are checking mine by hand. I've only received information on the first 3 matches (of 16) noted on my report thus far, so I'm not sure how much "tweaking" of the results they may end up doing for the final report. Click to enlarge. Looking at this tree of markers, I may not actually belong to a more defined subclade of U5b. Other than one marker on this tree which is shared by several of the U5 subclades (and therefore, is not likely a defining marker), I don't have any of the other markers shown on the tree mentioned in my preliminary report. I'll see if the final report has anything different than U5b, but as of now, U5b is it. Also, according to the defining mutations listed (Oct 2011) here, I don't have any of the defining mutations which would classify as anything other than U5b either. Me, descendent of the prehistoric Scandinavian matriarch, Ursula. My mtDNA motherline haplogroup U5b, although most recently in history coalseces around Budapest Hungary, is sourced (for my ancestral subgroup) in Sweden and Norway among my Scandinavian ancestors. Last night I dreamt of being among my ancient Scandinavian Viking kinfolk, who with me among them, entered again into the reality of this world! We are united! My mother Ursula is the most ancient Clan Mother in all Europe. I'm in the same (broad U5) mtDNA motherline haplogroup as Cheddar Man. Cheddar Man is the name given to the remains of a human male found in Gough's Cave in Cheddar Gorge, Somerset, England. The remains date to approximately 7150 BC, and it appears that he died a violent death. It is Britain’s oldest complete human skeleton. In 1996, Bryan Sykes of Oxford University first sequenced the mitochondrial DNA of Cheddar Man, with DNA extracted from one of Cheddar Man's molars. Cheddar Man was determined to have belonged to Haplogroup U5, a branch of mitochondrial haplogroup U, which has also been found in other Mesolithic human remains. Sykes got DNA from the 9,000 year old Cheddar Man's tooth, and from a 12,000 year old Cheddar tooth from the same cave. Bryan Sykes' research into Cheddar Man was filmed as he performed it in 1997. As a means of connecting Cheddar Man to the living residents of Cheddar village, he compared mitochondrial DNA (mtDNA) taken from twenty living residents of the village to that extracted from Cheddar Man’s molar. It produced two exact matches and one match with a single mutation. The two exact matches were schoolchildren, and their names were not released. The close match was a history teacher named Adrian Targett. They, like anyone else carrying haplogroup U5 today, share an ancestor of many thousands of years ago with Cheddar Man through his maternal line. Sykes argued that this modern connection to Cheddar Man (who died at least three thousand years before agriculture began in Britain) makes credible the theory that modern-day Britons are not all descended from Middle Eastern migratory farmers who entered Britain about 10,000 years ago. Instead, many modern Britons (and many modern Europeans generally) may be descended from ancient European Palaeolithic and Mesolithic hunter-gatherer tribes, who adopted farming much later. I carry the mtDNA genetic marker 16270.T, one of the defining mutations for mtDNA haplogroup U5 (Clan Ursula). Interestingly, this marker is also associated with mtDNA haplogroup K (Clan Katrine). From the article, Who are U? When Bryan Sykes named the “Seven Daughters of Eve,” “Katrine,” the founder of haplogroup K, was on an equal level with the other six European mtDNA founding mothers. However, most charts now show K as part of a superhaplogroup UK or as just another subdivision of U. If the names were assigned now, we might be called U9 or maybe U8a. Consequently, K haplotypes sometimes also have defining mutations for one of the U’s. The two situations which have come up involve mutations 16270T (which I have) and 16356C, which are the defining mutations for U5 and U4, respectively. So, while it's not mentioned in my preliminary results as to whether or not I have any of the defining mutations (16224C and 16311C) of haplogroup K (making it very likely that I do not have these defining haplogroup K mutations1), research shows that haplogroup K descends from haplogroup U, through a U5-U4 (UK) superhaplogroup . Many Western European Jews fit into haplogroup K, while my Eastern European Hungarian Jewish mtDNA result fits into haplogroup U5. U5 is an older haplogroup than K. So, these facts are congruent with the DNA Tribe results which say that my Jewish line is not Northwestern European, but Eastern European (Austro-Hungarian) even though Clan Ursula has strong links to Scandinavia and Celtic lands. The 5656G allele, including all major subsets of U5b1, is broadly distributed both in western and eastern Europe (fig. 3A; table 4). The U5b1b subclade is found all over Europe, but it occurs in western and central Europe with notable sequence variation. The haplotype diversity (excluding subclade U5b1b1) is 0.96. We note that U5b1b was also identified in a northwestern African population, among the Moroccans. In contrast, its diversity in eastern Europe is much lower. There, the haplotype diversity (excluding subclade U5b1b1) is 0.79, whereas most of the U5b1b sequences in eastern Europe belong to the U5b1b1 branch. In the Eurasian cohort, U5b1b (other than U5b1b1) is absent from native Siberians and is notably absent from the Ob-Ugric populations and the Samoyeds. Most importantly, the data indicate that U5b1b1, the only subcluster of U5b in the Saami population [my Sweden and Norway link], is present outside the Scandinavian-Baltic and the Volga-Uralic regions—namely, in the French, Croatian, Bosnian, Slovenian, Czech, Russian (Kyrgyzstan - mine), Ukrainian, Polish, and Hungarian (mine) mtDNA pools—and, further, is present even in the Caucasus, among the Nogay, Kabardinian, and Armenian (mine) mtDNAs. ... although the U5b1e subclade is another possibility for me - "U5b1e has polymorphisms in 152 2757 10283 12616 16189 (I carry mtDNA marker 16189.C) and has lost its polymorphism in 16192 (backmutation) ( + U5b1 polymorphisms) and arose about 6600 years ago. U5b1e is mainly seen in central Europe among Czechs, Slovaks (mine), Hungarians (mine) and southern Russians (mine through Kyrgyzstan)." 1It may still be true, that I have other genetic markers not mentioned in the preliminary results, as in the email, I was told that "our results are now in the process of being checked manually. Generally there are only minor adjustments to be made. The final results of our analysis will be sent to you ..."
Well, I am definitely surprised by the preliminary results I received today from my motherline mitochondrial DNA (mtDNA) genetic haplogroup analysis. The final results with more detail and explanations will be sent to me within the next few days or so according to the email, after results are checked by hand by the researchers. 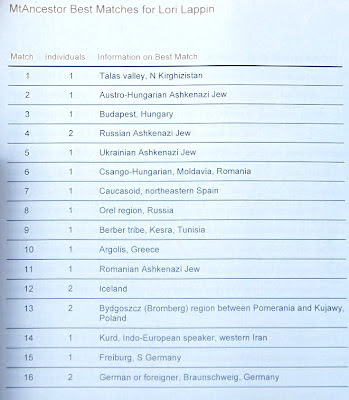 It seems that, while my comprehensive ancestry (compiled through autosomal STR analysis of genetic markers I inherited from both my mother and father) is Northwestern European (Wales, England, Scotland, Sweden, Ireland, Norway, Germany, Belgium, Italy) and Asian-Middle Eastern (Armenia, Budapest Hungary Ashkenazic Jewry, Turkey and Israeli Jewry), my motherline is not primarily centered in Northwestern Europe (although my mtDNA haplogroup has strong Swedish and Norwegian roots). Generally, my mtDNA motherline (from the data so far, at least) coalesces in Eastern Europe (Austro-Hungarian) and Turkish-related areas (Talas Valley Kyrgystan). I'd never heard of Kyrgyzstan before today. It seems to have been part of Russia until it achieved independence in 1991. It is primarily Turkish - a Turkish genetic connection is congruent with the earlier autosomal DNA tribe results (DNA Results label) I received from another independent lab (DNA Tribes in the USA) not associated with the lab through whom I received these mtDNA results (Roots for Real in Europe). Austro-Hungarian Ashkenazi Jew is self explanatory. The Budapest, Hungarian result fits with the more specific Austro-Hungarian Ashkenazi Jew in a more general sense. Both of these results are also congruent with the DNA Tribes results received earlier. Second, My mtDNA haplogroup branch is U5b. Although U5b is strongly found in Sweden and Norway (also congruent with earlier DNA Tribe results), it looks like my motherline branch of it is more Eastern Europe (Hungary area) and Asian (Turkish area). 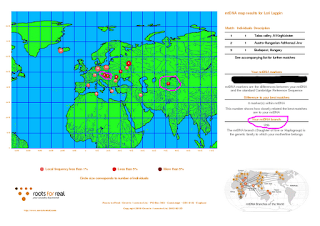 In fact, none of the dots on my motherline map (see below) are placed in Northwestern Europe. The Saami are regarded as extreme genetic outliers among European populations ... It (the research) was shown that the “Saami motif” variant of mtDNA haplogroup U5b is present in a large area outside Scandinavia ... It (the research) suggests that the large genetic separation of the Saami from other Europeans is best explained by assuming that the Saami are descendants of a narrow, distinctive subset of Europeans. Research has shown that "Turkish Jews are mostly H and X haplogroups." Research has also shown that "As to MtDNA U5b among Jews, this haplogroup is rare among both Sephardic and Western Ashkenazi populations, but is found among Eastern European Ashkenazim, supporting the theory of some admixture among the Eastern European Jews." Research has also shown that "Haplogroup U5 and its subclades U5a and U5b (mine) form the highest population concentrations in the far north, in Samii, Finns, and Estonians, but it is spread widely at lower levels throughout Europe. This distribution, and the age of the haplogroup (up to 60,500 years old), indicate individuals from this haplogroup were part of the initial expansion tracking the retreat of ice sheets from Europe ~10kya. Haplogroup U5 is found also in small frequencies and at much lower diversity in the Near East and parts of northern Africa (areas with sizable U6 concentrations), suggesting back-migration of people from Europe to the south." At any rate, U5b is a European haplogroup with strong Scandinavian and Celtic links, but it looks like my particular cluster of genetic mtDNA markers (not disclosed publicly here, although they are on my results) closely align around Hungary (specifically, Budapest) and a Turkish-related area (specifically, Talas Valley North Kyrgyzstan) - far away from Scandinavia and Celtic lands. Taking all this together with my DNA Tribe results, it is very likely that my mtDNA motherline may suggest a population of "Scandinavian-Celtic" Ashkenazic Jews originally from Northwestern Europe, whose later descendents migrated from there and settled primarily in Hungary and Kyrgyzstan (although I am speculating). Hopefully, the final mtDNA results will add some insightful additional information.